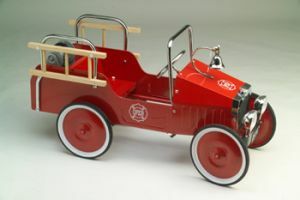 The 1938 Jalopy Fire Engine Pedal Car is an impressive toy sure to delight children. The attention to minute detail is evident in the many features and will keep kids focused and entertained for hours as they head off to fight pretend fires. While adult supervision is required, this toy is Safety Tested and Approved. Ages 2-6.